In this edition John answers questions on the unofficial world champions, Llanelli's Welsh internationals in 1958, Lions captains who went on to Rugby League, the first French Championship final and England's youngest front-row. 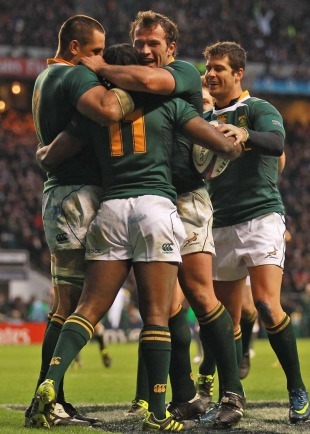 2010 - South Africa, who have not "been challenged" since beating England at Twickenham in November. Llanelli supplied Terry Davies, Cyril Davies, Ray Williams, Carwyn James, Wynne Evans and Rhys Williams to the Welsh side that beat Australia 9-3 in January 1958. It was Carwyn James's first game for Wales, standing in for Cliff Morgan at fly-half. James was also capped as a centre later that season when Morgan was restored. In 1957, the club had also given Wales prop Henry Morgan and wing Geoff Howells (whose passing was noted in Star last month). Howells was best-remembered for breaking Ken Jones's stranglehold on the right-wing position in the Welsh team. Jones played in all 43 of Wales's post-war internationals between 1947 and 1956 before Howells faced England in 1957. When the Newport flyer was recalled for his 44th (and last) cap against Scotland at Murrayfield the following month, the Welsh selectors retained Howells, switching him to the left wing. There was only one tour captain who fell into this category: Robin Thompson, who led the 1955 Lions to their two-all drawn series in South Africa, later joined Warrington RL. David Watkins, who stood in as Test captain for tour skipper Mike Campbell-Lamerton on the 1966 Lions tour in New Zealand, later went to Salford RL and won Test honours at the highest level at both codes. Since the game went open in 1995, Wales's Gareth Thomas is the only other player who has led the Lions in a Test (deputising for tour captain Brian O'Driscoll in New Zealand in 2005) before going on to play top-flight Rugby League. Before Australia, New Zealand and France became full members of the International Board they were free to make their own interpretations and variations of the laws. Only when they met full members in international matches did they have to adhere to the laws laid down by the Board. In the early 1900s, for instance, it was common for Australia and New Zealand to use substitutes for injured players when they met one another. It wasn't until 1968, however, that the Board permitted their use at Test level. In 1892, Racing won the first-ever French Championship final 4-3, each side scoring a converted try (worth three points each) and Racing obtaining the winning point through a "tenu en but" credited to Frantz Reichel. Translations of the match reports indicate that five minutes from the end he broke from a scrum but was held up over the line by Henri Amand, his opposite number, but was unable to touch the ball down. In British rugby at this time the laws refer to "a maul in goal" and stipulate the (complex) conditions governing that phase of play. In Britain, however, it was only possible to score a try by touching the ball down in the opposition's goal area and a conversion had to follow. It would seem that the French had an alternative interpretation of this particular phase, awarding a scoring point but denying the conversion attempt. The maul in goal was abolished in 1892 and presumably disappeared from the French version of the game at around the same time. The average age of Alex Corbisiero, Dylan Hartley and Dan Cole was 23. In the corresponding match against Italy in Rome last year England had Matt Mullan, Hartley and Cole on the field together for part of the second half. Their average age was 22.